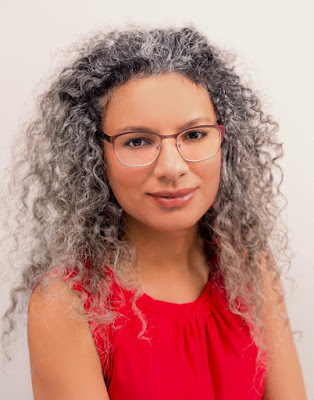 Lauren Russell is the author of What’s Hanging on the Hush (Ahsahta, 2017). She was the 2014-2015 Jay C. and Ruth Halls Poetry Fellow at the Wisconsin Institute for Creative Writing, the 2016 VIDA Fellow to the Home School, a 2017 National Endowment for the Arts Creative Writing Fellow in poetry, and the 2018 Cave Canem Fellow to the Rose O’Neill Literary House at Washington College. Her chapbook Dream-Clung, Gone came out from Brooklyn Arts Press in 2012, and her work has appeared in The New York Times Magazine, boundary 2, The Brooklyn Rail, jubilat, and Bettering American Poetry 2015, among others. She is a research assistant professor and is assistant director of the Center for African American Poetry and Poetics at the University of Pittsburgh. My mother is a cultivator of roses that smell alternately deep red and light pink but always a little sharp, a little free, never perfume sweet to be worn once and shut up in a drawer—no, not these (13). My mother’s roses grow on neatly pruned bushes, but I imagine roses growing wild on high walls, stabbing any intruders with their thorns, like the brambles in Sleeping Beauty, who is sometimes called Briar Rose. Such walls are made to be bulldozed. Or fitted out with windows and secret passageways. Or parachuted over. This is a comment on genre (10). I am trying to construct a poem or other artwork with these interview questions (20). (Did I say that walls are meant to be bulldozed?) I have written all my responses on index cards and shuffled the deck. The process of transcription is also a process of reinvention. I am changing the language and the sequence as I go (3). Hence you will not be surprised that I would like to take up collage in a serious way (16). I’d also like to befriend a horse (16). Writing is a process of discovery, through many drafts by hand in a notebook (3). In the face of a block I can neither bulldoze nor parachute over nor scale on real or imaginary horseback, I simply rewrite the previous section. By hand. This exercise of hand-and-brain-muscle coordination generates a momentum that nudges the draft forward, bit by bit, and I refine my older work with each new iteration while at the same time reaching further ahead (12). My life has not changed in any bolt of lightning sort of way, but gradually, the public distribution and consumption of my writing have made me seen (1). This aperture or porthole of visibility is not, however, why I write. I am more invested in the process than the outcome (9). Sometimes I think this is because I am an introvert. I have a poetry job that often interferes with the actual production of poetry, but it gives me some flexibility in the summer, so I can shut myself away at writing residencies for a month or two at a time and maintain a temporary but sustained attention to the page (11). In the face of a wall I cannot crack or scale or bulldoze or parachute over, at the very least I can tell the truth about it (7)—though increasingly I think that who owns the narrative matters more than what actually occurred (6). Origin story (my own narrative): Poetry came for me in second grade, when the poet Cecilia Woloch began conducting after-school writing workshops at my elementary school through California Poets in the Schools (2). But I was a writer before I could write. The impulse was in me from birth (18). I often think of Alice Walker’s essay “In Search of Our Mothers Gardens”: What if literacy had been denied me? Would I be a storyteller, a songstress, an arranger of flowers, a piecer of quilts? In this life, I have always been a writer, so I have been lucky, but surely I would exercise my creativity in whatever life held me (17). This is one of the concerns of my manuscript Descent, in imagining the life of my great-great-grandmother Peggy in freedom and in slavery (6). Today I finished reading Christina Sharpe’s In the Wake, which concerns the afterlife (the wake) of slavery (19). This is also a concern of Descent (6)—a hauntology, to take a term from M. NourbeSe Philip (15). If the content determines the form and vice versa, apply the same logic to the book—“bookness” varying from project to project. What’s Hanging on the Hush is a collection of discrete poems assembled after the fact, whereas Descent was conceived as a single book-length work (4). Descent is rendered as song, and it’s a song that will never stop hurting. If you want to know how I hear my work, how it lives in my body, come to my readings (5). Sound is essential to poetry, which I first learned from the work of Gertrude Stein and Harryette Mullen and Alice Notley’s essay “American Poetic Music at the Moment” (15). Poetry is what Terrance Hayes calls “music without full instrumentation” (15). Instruments come in many forms. A good editor can pull a sentence taut like a wrench tightening a socket, but the most aggressive or proactive among them may also alter the shape of the art (8). (Did I say that walls are made to be bulldozed? But first should I have specified who’s driving (10))? Ultimately, why do I bother with structure when I keep suggesting that construction only invites demolition? Am I implying that genre by its nature is a site of rupture (10)? I hate how academics use the term “violence” so expansively, but there is a violence to what I am asking: Should I, writing away at a table quite safely, even speak of walls and bulldozers and border crossing metaphorically given the literal fact of what is happening today (6)? Because walls are made to be bulldozed, I am not in a monogamous relationship with poetry. For instance, the films of Todd Haynes call to me, especially Velvet Goldmine—its approach to narrative, image, allusion, time, and desire. Desire! (14). Desire: Suppose I say that at this precise moment, my love is writing in the adjacent room, and at the same time that I wish not to be interrupted, I also wish he would come over and kiss* me? These are two contradictory desires that held simultaneously are poetry (2). They are also the conditions of my genre crossing: Can two possibilities be realized equally? And if not, how do we name such yearning (10)? 10 - How easy has it been for you to move between genres (poetry to reviews to short lyrical prose)? What do you see as the appeal?